In this book Mr. Whickam is a vile person, who plans a scheme to compromise Elizabeth and ruin Darcy’s happiness forever, but things don’t go as planned, and it is Mr. Darcy who ends up being caught in a compromising situation. In this variation we see Elizabeth slowly falling in love with Mr. Darcy and wanting him to love her back. I loved Elizabeth’s worry for Darcy when he went out to help the farmers with the fire, and most of all, I loved when she decided not to let him go alone to Longbourn in search of Whickam. For me, that was pure love and dedication. I loved that Darcy and Elizabeth’s relationship evolved slowly, and that they actually had a courtship time. 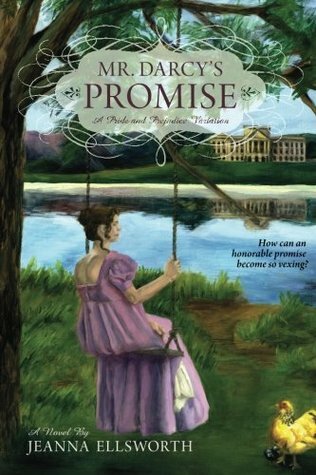 With his promise, Mr. Darcy gave Elizabeth a chance to be courted in a very special way. This special courtship allowed them to have private and romantic moments they would not be allowed if they were actually just engaged, so this book takes advantage of this situation, and we get the better of 2 worlds: a regency novel and some liberties taking place without being considered a breach of propriety. This sounds like such a really sweet read. Forced marriage scenarios can work out well as Darcy tries not to show lizzy’s that he’s in love with her,while we are privy to Lizzy’s falling in love with Darcy. Gotta add it to my TBR list. Oh! I loved this! I hope you do read it! What I love most about forced marriage scenerios are that the rules of private time are less limited. It was so fun to think up romantic ways for a husband and wife to fall in love! The forced marriage scenario can be fun. I like them too as long as the angst and misunderstandings don’t carry on too far. This one does sound sweet and the situation helps develop the romance. I want to read it now. Thanks, Rita! I’ve had this one sitting on my Kindle for ages. After reading your review, Rita, sounds like I should bump it up the TBR list. Loved the review, Rita, as much as I loved Jeanna’s story. Thanks, it was so nice to be reminded of it. It’s ever so sweet to see out favourite couple falling in love at such close quarters, which is what makes forced marriage scenarios so sweet and poignant and such fun to read.